How Google Instant will (and won’t) impact your optimization strategy. No longer do you have to find ways to kill time while you wait for your search results to appear. Or waste precious moments clicking “Search” or hitting that pesky Enter key. (Your pinky will thank you.) 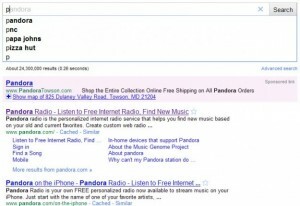 According to Google, this innovation can save you 2-5 seconds per search. So if you do 12 searches a day, you could regain a full minute in productivity. Imagine the possibilities! Sarcasm aside, Instant is a pretty neat feature. And like everything Google does, it has web marketing pros speculating about impact on SEO. More on that below. If you have the right browser, the best thing to do is try it yourself. Otherwise, here’s a brief explanation: As soon as you start to search for something, results appear. With each word you add, and often with each letter, those results change to become more specific to your query. Meanwhile, suggestions automatically appear in the search bar. As you type, these are also instantly updated with predictions based on search popularity. 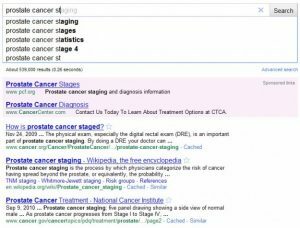 In this example, if “prostate cancer symptoms” was what I was looking for, I could stop typing right now because the results for this query have already appeared. Since Google Instant debuted a few weeks ago, I’ve spent quite a bit of time with it (all work-related, of course). At first it was really distracting—my eyes kept shifting down every time the text below would change. Then it was annoying. As results appeared, I’d glimpse one that looked interesting. But before my brain could process what I’d seen, my fingers had clacked a few more keys and that intriguing link was history, a new search result in its place. Lately it’s become distracting again, as I’m starting to doubt my ability to string together an effective set of keywords. With every stroke of my keyboard I glance down at the screen to see what’s coming up. If the results are no good, I’ll backspace and enter better search terms. This constant self-correction is mildly time-consuming—however I guess I’m saving a lot of time, too. Not as much clicking around on irrelevant websites or scouring page after page of Google to find what I was really looking for. What it does change—and I experienced this personally—is how we search. And this shift may indirectly impact rankings because of how we interact with our search results. 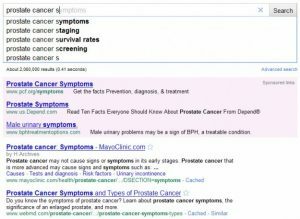 As users figure out how to use Google Instant to their advantage, they could lose interest in the search results that appear farther down on the page (“below the fold”). Instead they may choose to refine queries until what they’re looking for appears at the top. Forget about the results on pages 2, 3 and so on. Plus, with the dropdown suggestion box taking up valuable real estate, many sites that previously enjoyed page 1 rankings will be relegated to page 2. Additionally, if users are apt to accept the suggestions that automatically appear as they type (as opposed to entering what they may have instinctively searched for), the same queries will be searched over and over. This gives further visibility to the sites that already appear toward the top of the rankings. If Google Instant changes our search habits, will it change our SEO strategy? It stands to reason that if people are searching for things in different ways, we should adjust our SEO strategy accordingly. The interesting thing about Google Instant though, is that it will only make people better at finding exactly what they’re looking for. SEO expert Eli Feldblum, in a guest post on TechCrunch, offers some insight into what people can do to address the changes being brought on by Google Instant. What it comes down to is that SEO is more important than ever. Now optimizing for popular search terms will be even more vital, and the competition to land among the top few ranks will be even stiffer. Even more reason to up our SEO game. With the increased likelihood that our sites will be judged on first impressions (and possibly discovered during a detour) descriptive title tags and succinct, smartly-optimized copy will mean the difference between being clicked or ignored. *Google Instant isn’t yet available everywhere, and it only works on certain browsers (Chrome v5/6, Firefox v3, Safari v5 for Mac, and Internet Explorer). Also, you can only see it if you’re searching for something at google.com, not in the Google toolbar widget or on your personalized iGoogle homepage. Google has plans to roll out the feature globally, beyond its homepage, and on mobile devices in the near future. For an interesting take on the impact Google Instant may have on paid search campaigns, check out page 2 of eWeek’s How Google Instant Will Impact SEO. For more on SEO best practices, read my previous post: U.S. News says we’re #1. Why doesn’t Google? For the past decade or so, Jenn has been busy acquiring valuable professional experience and sharpening essential skills in a range of communications disciplines. In a previous life (before discovering the endless wonders of the World Wide Web), she was a public relations pro, managing several agency accounts in the healthcare, education, non-profit and retail verticals. Jenn’s love for persuasive writing led her to pursue a fresh career—one that has evolved from direct mail, ad copy and TV commercials to writing for the web. 3 Comments on "The end of SEO as we know it? Not so fast." Jenn, thanks, great article. Question for you: so now when we're purchasing keywords for SEM campaigns, do we need to worry about misspellings/variations on keywords as much? Great question! From what I've read, Google Instant (GI) shouldn't impact how you form your keyword lists - at least not too much. There still will be people who search using iGoogle and toolbar shortcuts, rather than going to http://www.google.com (which currently is the only way to see GI). Additionally, there will be others who will deactivate GI, or who will ignore the suggested spelling correction and keep typing anyway. It is worth noting that now when you misspell a word in the search box, the red squiggly line appears -- this will prompt many users to correct their query before continuing. You may find that fewer people are finding your ads through misspelled words, but given that these are typically less expensive words to bid on, it might still be worth your while to keep them in, or do a test period and stop bidding on them if they don't yield much traffic.